Illustration of visitors to the completed Merriweather Park at Symphony Woods. (Click for a higher-resolution version.) The Chrysalis is in the background to the left, beyond the Caterpillar. Image © 2014 Inner Arbor Trust; used with permission. tl;dr: I discuss how the Chrysalis and Merriweather Park at Symphony Woods can attract visitors, based on research conducted by Integrated Insight. The previous few articles in this series discussed the design and construction of the Chrysalis itself. There will be one more article discussing the final architectural details of the Chrysalis, but in the meantime before construction is completed I’ll take a detour and discuss other aspects of Merriweather Park at Symphony Woods. In particular, this article focuses on how Merriweather Park might attract visitors and how many visitors could be reasonably expected once the park is built out, based on research conducted for the Inner Arbor Trust by Integrated Insight, Inc.
A sampling of attractions operated by Walt Disney Parks and Resorts, including theme parks, cruise ships, and resort hotels. (Click for a higher-resolution version.) Images © Walt Disney Co.
Over the 50 years that Symphony Woods has existed many people have proposed ways to encourage more visitors, from early attempts by the Columbia Association to promote Symphony Woods as a picnic area for families to CA’s more recent efforts to formally develop the area as “Symphony Woods Park” (the so-called “Paumier plan”). However during that entire time few if any people made a serious effort to research exactly what types of park features might best attract visitors, and how many visitors might reasonably be expected as a result. When the Inner Arbor Trust was given the responsibility of developing Symphony Woods as a park, one of its first actions was to commission exactly such a study. To perform the research the Trust turned to the Florida-based firm Integrated Insight, Inc. Integrated Insight was founded in 2009 by Joni Newkirk, Scott Sanders, and other former executives of the Walt Disney Company. Newkirk had previously worked as a senior vice president responsible for researching, forecasting, and optimizing business for Walt Disney Parks and Resorts, the organization responsible for Walt Disney World, Disneyland, the Disney cruise line, and other Disney attractions around the world. Jim Rouse was a fervent admirer of Walt Disney and his work in creating the Disney theme parks, once referring to Disneyland as “the greatest piece of urban design in the United States today …, [fulfilling] all its functions it set out to accomplish, un-self-consciously, usefully, and profitably to its owners and developers”. Rouse’s work in creating festival marketplaces like the Inner Harbor development in Baltimore can be seen as adapting various aspects of Disney’s ideas to an urban setting. Although Jim Rouse did not have the opportunity to work with Disney while at the Rouse Company, afterwards he explored creating a joint venture between the Walt Disney Company and the Enterprise Development Company, the for-profit arm of his nonprofit Enterprise Foundation. The lead on that project was Michael McCall, who was later to found Strategic Leisure, Inc., and then to spearhead development of Symphony Woods as president of the Inner Arbor Trust. 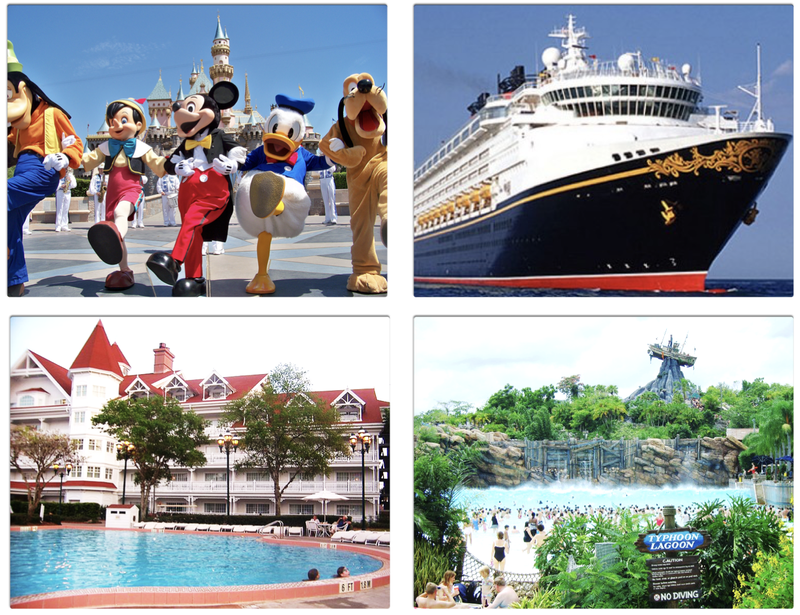 McCall was thus familar with Disney’s various projects, the executives responsible for them, and the capabilities that Disney had built in strategy and operations for its parks and resorts. Those parks and resorts owe their success not just to the family-friendly image carried over from Walt Disney’s animated films, but to the Walt Disney Company’s application of sophisticated business practices to every aspect of running the parks: promoting the parks to potential visitors via various channels, forecasting park attendance to a high degree of accuracy, ensuring that visitors have a wide variety of park experiences available to them, engineering the layout and other aspects of the parks (including the lines for rides) to optimally accomodate visitors, and doing all this in a way that both delights visitors and is financially sustainable. Joni Newkirk, Scott Sanders, and their colleagues played key roles in all of these areas. When they left Walt Disney Company to form Integrated Insight they brought with them a wealth of expertise in providing entertainment, travel and leisure organizations services including market research and consumer insights, forecasting and feasibility analysis, revenue and profit optimization, and capacity and operational planning. It was thus natural for Michael McCall and the Inner Arbor Trust to turn to Integrated Insight for advice on how to turn the Inner Arbor vision into a successful park. Examples of attractions in the U.S. and elsewhere used for comparisons with the proposed Merriweather Park at Symphony Woods. (Click for a higher-resolution version.) Image © 2015 Inner Arbor Trust; used with permission. Integrated Insight first looked at the proposed Merriweather Park at Symphony Woods in the context of its likely market and of comparable and (in some cases) competitive attractions around the U.S. and beyond. In doing this Integrated Insight (following the lead of the Inner Arbor Trust) considered the Symphony Woods property not in isolation but rather as integrated with Merriweather Post Pavilion: events at the pavilion will drive visits to the park, and features of the park will enhance the pavilion experience. Integrated Insight also considered all the park features envisioned in the original Inner Arbor concept plan: not just the Chrysalis, but also other elements like a sculpture garden, a café, and so on. This recognized that the appeal of Merriweather Park at Symphony Woods for visitors will not be tied to any one park feature (just as, for example, visits to Disneyland aren’t driven by any one attraction). Instead Merriweather Park’s appeal will be a function of the total park experience. As it turns out, some of the elements in the Inner Arbor concept plan are not part of the currently-approved plan for Merriweather Park at Symphony Woods, like the “treehouse” structures proposed as part of the elevated boardwalk. Others will likely be present, but not necessarily as part of Merriweather Park itself. For example, the proposed New Cultural Center on the Toby’s Dinner Theater site next to the park will provide indoor performance venues similar to those proposed in the concept plan. However, the overall principle remains sound: what will attract visitors is the overall experience of the Merriweather-Symphony Woods Neighborhood and related cultural attractions in the Merriweather District—Howard Hughes Corporation’s term for the combination of the Merriweather-Symphony Woods Neighborhood and the Crescent Neighborhood surrounding it to the south and west. There are 8 million people within 50 miles of Merriweather Park at Symphony Woods, an additional 6 million people between 50 and 100 miles away, and another 10 million people between 100 and 150 miles away—a total of 24 million within a 3-hour drive. These form the core markets for Merriweather Park, although it is also possible that visitors from further away will spend some time at the park while visiting the Baltimore or Washington DC area (e.g., as tourists or for family visits). Thus Integrated Insight’s list of comparable and competitive venues includes a mix of local attractions and more remote ones. For example, the Inner Arbor concept plan included a proposed sculpture garden south of Merriweather Post Pavilion. As part of the research study Integrated Insight looked at almost a dozen sculpture parks elsewhere in the U.S. and around the world, with park sizes ranging from less than 2 acres to over 1,000 acres, park entry fees of up to $12, and annual attendance from about 80,000 people to 1 million people. These figures, along with the detailed descriptions in the research reports, provide some reasonable guidance on the possible appeal to visitors of a comparable sculpture garden within Merriweather Park at Symphony Woods, along with what it would take to make such a garden artistically and financially successful. One comparison of particular interest is to “cultural districts”, that is, areas within cities that feature multiple cultural attractions and are marketed as a single overall entity to prospective visitors. For example, the Pittsburgh Cultural District (overseen by the Pittsburgh Cultural Trust) covers 14 city blocks and features 7 theaters, 8 public parks and art installations, 12 art galleries, 50 restaurants and other places to dine, and 90 retail shops. In total the Pittsburgh Cultural District hosts 3,000 events and attracts 2 million visitors each year. Again, this emphasizes that, just as the individual features within Merriweather Park at Symphony Woods should not be considered in isolation, Merriweather Park should not be considered in isolation from the broader downtown Columbia area, especially the Merriweather District south of The Mall in Columbia. That area alone includes a host of cultural attractions existing, planned, and proposed, including the renovated Merriweather Post Pavilion, the Chrysalis and other features planned for Merriweather Park at Symphony Woods, the New Cultural Center planned for the Toby’s Dinner Theater site, and a proposed new Central Branch library and a possible indoor music venue in the Crescent Neighborhood. If all of these are realized they will work in concert (no pun intended) to make downtown Columbia an attractive destination for both locals and visitors interested in culture and the arts. Breakdown of participants in the Integrated Insight survey researching potential visitors to Merriweather Park at Symphony Woods. (Click for a higher-resolution version.) Image © 2015 Inner Arbor Trust; used with permission. 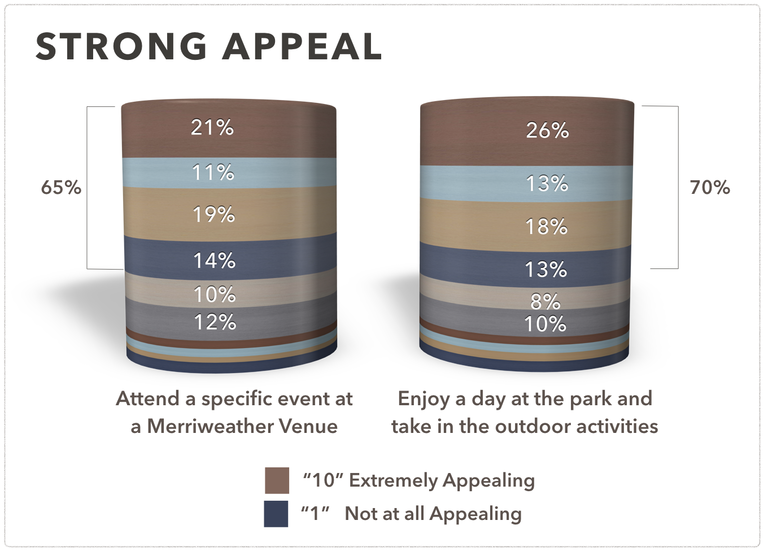 In addition to researching comparable and competition attractions to Merriweather Park at Symphony Woods, Integrated Insight conducted a survey of 1,000 people to (among other things) further estimate the total market for Merriweather Park, determine what proposed park features, special events, and other aspects were most appealing to potential visitors, learn what revenue opportunities there might be for park attractions, and estimate how many people were likely to visit the park and its associated venues. 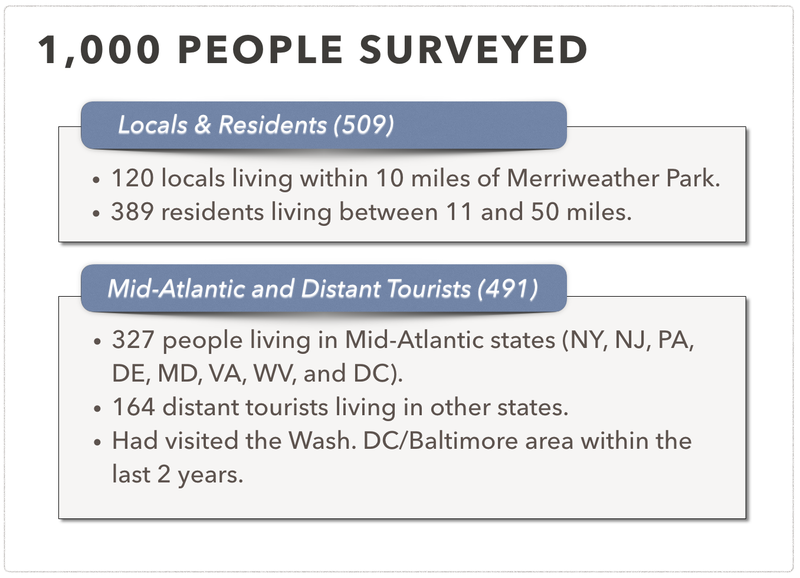 The survey included four groups of people: locals (within 10 miles of the park), residents (within 11-50 miles), mid-Atlantic tourists (recent visitors to the Washington DC/Baltimore area from various mid-Atlantic states, and distant tourists (recent visitors to the Washington DC/Baltimore area from other states). In addition, participants were screened to include only those who had participated in various cultural events (concerts, festivals, live theater, etc.) within the last two years, had visited parks or cultural venues (museums, art galleries, sculpture gardens, etc.) within the same timeframe, or expressed significant interest in such participation or visits. As noted above, the purpose of the research was to gauge potential visitors’ interest in Merriweather Park at Symphony Woods as envisioned in the Inner Arbor concept plan, not just the Chrysalis. Participants in the survey read a three-paragraph description of Merriweather Park (“In the middle of the Baltimore/Washington Corridor lies a beautiful and extraordinary escape, a forested culture park, founded in music and adorned with art…”) and watched a video that included renderings of the proposed park features. They answered various questions to determine demographics, elicit their opinions on the park, and gauge the likelihood of their visiting it. Tourists are less affluent than locals (not surprising given the demographics of Howard County) and have a higher mix of families. Distant tourists are also relatively younger. Most tourists to the Washington DC/Baltimore area are repeat visitors likely to be looking for new and interesting things to do. Tourists have specific interests in cultural attractions, outdoor parks and performance venues, and festivals—all characteristics of Merriweather Park at Symphony Woods. The overwhelming majority of visitors will have access to a car, and thus easy road access and parking for Merriweather Park will be an important factor in their willingness to visit. Tourists participate in outdoor, cultural, and festival activities and have a high interest in continuing to do so. However attending concerts and live performances is not a primary driver of visits to Washington DC or Baltimore. The vast majority of tourists do not plan their entire trip but leave at least some time open for last-minute activities. They also tend to drop 1 out of 4 planned activities from their itineraries. Together these mean that people are open to stopping by Merriweather Park for some reason or other, but their likelihood of visiting is stronger if they’ve already committed to visit (e.g., by buying tickets to a festival or other event). Tourists have a lot of choices for activities in Washington DC and Baltimore. The majority of them have family in the area, and in many cases family members accompany them, so positive word of mouth and family endorsements will be key for attracting people to Merriweather Park. Locals and residents generally have similar interests to tourists. Locals and residents with families are more interested in participating in activities than those without, except for attending concerts and visiting art galleries (for which interest is comparable). Awareness of Merriweather-related events is relatively low compared to awareness of nationally-recognized events like the Cherry Blosson Festival: no more than half of locals and residents were aware of Wine in the Woods, with even fewer aware of any of the various Merriweather Post Pavilion music festivals (Capital Jazz Festival, Virgin Freefest, etc.). Nevertheless, significant numbers of locals and residents have attended performances at Merriweather Post Pavilion or Toby’s Dinner Theater. Percentages of survey respondents expressing strong interest (7-10 on a 10 point scale) in Merriweather Park at Symphony Woods as it’s proposed to be built out. (Click for a higher-resolution version.) Image © 2015 Inner Arbor Trust; used with permission. In addition to the questions about visits to and interests in atractions in the Washington DC/Baltimore area, the Integrated Insight survey also asked people their opinions about the proposed Merriweather Park at Symphony Woods. Those surveyed were asked to rate on a 10-point scale both their interest in attending an event at Merriweather Park and their interest in simply spending some time at the park. They were then asked to explain in their own words why they had rated their interest the way they did. About two-thirds of all respondents indicated a strong interest (7-10 rating) in attending an event or just visiting the park. (See the figure above.) Of those indicating strong interest, reasons included the park sounding fun, being different and unique, providing outdoor activities, and providing entertainment. Only 10% of all respondents indicated they had little interest (1-3 rating) in visiting Merriweather Park at Symphony Woods. The most common reasons for their low ratings were the distance they would have to travel (for example, for Virginia residents who would have to cross the Potomac River) and lack of interest in what the park had to offer. In general those with little interest were relatively older, were not living with other family members, and had less interest in attending live performances. A significant fraction of respondents expressed extreme interest in both spending time at Merriweather Park at Symphony Woods and also attending events there (rating of 10 on both questions). The locals and residents expressing such extreme interest tended to be those who often hosted out-of-town visitors, more frequently attended performances at local venues, and more frequently visited The Mall in Columbia and a branch of the Howard County Library System. The words survey respondents used to describe Merriweather Park at Symphony Woods were overwhelmingly positive: “great”, “wonderful”, “amazing”, “fantastic”, “spectacular”, and so on. Only 5% of the words used to describe the park were negative (e.g., “boring” or “overdone”). The most appealing aspects of Merriweather Park were the outdoors aspect, the presence of multiple things to do, the events and performances, and the art and architecture. Almost half of all respondents could not name anything they did not find appealing. Of those who did name negatives the most frequently mentioned were distance, access, crowds, and parking—although it’s worth noting that less than 5% of respondents expressed concerns about parking and traffic. Overall the survey respondents came away with a strong positive impression of Merriweather Park at Symphony Woods. A question eliciting word impressions of the likely effect of the park on people produced responses like “merry”, “happy”, “free”, and “relaxed”, while two thirds or more strongly agreed with statements that Merriweather Park would be “a place to explore”, “a place with diverse offerings”, “green”, and “a commmunity park I would be proud of”. Almost as many people strongly agreed that Merriweather Park would be “a good fit for Maryland” and “a good fit for Columbia”. The survey also asked respondents to rate the appeal of 12 individual park features, including all the elements proposed as part of the original concept plan (like the Treehouse Skywalk) or added later (like the Merriground play area). The majority of respondents rated all park elements as highly appealing (8-10 on a 10-point scale). The 6 most popular features were the Treehouse Skywalk, Fountain Plaza, and sculpture garden (proposed in the concept plan), the Picnic Table and Caterpillar (part of the approved Site Development Plan), and Merriweather Post Pavilion itself. Since this series has been focused on the Chrysalis, it’s worth noting that the survey respondents found the Chrysalis to be a unique park element—84% could not name another venue it reminded them of. The most common responses from people referred to the Chrysalis as “amazing” or “great”, and highlighted its relatively intimate scale, architecture, and setting; only a small minority did not like the Chrysalis. The bottom line is that people responded most strongly to those proposed aspects of Merriweather Park at Symphony Woods that were most unlikely to be duplicated elsewhere—both unique events to attend (e.g., festivals and special performances) and unique park features that could be experienced during family outings. These aspects in turn increased the interest of those in the mid-Atlantic states and beyond in visiting the Washington DC/Baltimore area. Estimated annual attendance for Merriweather Park at Symphony Woods once built out (including events at Merriweather Post Pavilion) compared to other U.S. attractions. (Click for a higher-resolution version.) Image © 2015 Inner Arbor Trust; used with permission. Finally, Integrated Insight used various questions combined with known attendance at existing destinations to estimate future annual attendance at the completed Merriweather Park at Symphony Woods. The first step was to ask respondents to estimate how often they might visit, and what might draw them to the park. About half of locals and residents combined indicated they would likely visit at least a few times a year, with others indicating they would visit more often. As noted above, the most common reasons given for likely visiting were to attend specific performances or have a family outing. Interest among tourists was also strong, with about three quarters of respondents indicating they would likely visit Merriweather Park at Symphony Woods if it were open while they were visiting. About half indicated their interest was strong enough they might plan a special visit to the area to visit Merriweather Park. However expressed interest in visiting a place does not always translate into an actual visit. To get a better estimate, Integrated Insight started with the populations in the various groups of potential visitors (locals, residents, mid-Atlantic tourists, and distant tourists), reduced the population to include only that fraction expressing strong interest in visiting (from the survey results), and then for tourists further reduced it to include only those visiting the Washington DC/Baltimore area in the past year.1 This resulted in an estimated addressable market for Merriweather Park at Symphony Woods of about 30 million people. Intergrated Insight then further adjusted its estimates to account for any overstatements respondents might have made regarding their intentions to visit the park. For example, if one took at face value the information provided by respondents regarding past visits to Merriweather Post Pavilion and extrapolated that to the size of the estimated addressable market, one would conclude that the pavilion had about 8 times more visitors per year than the actual attendance figures. In other words, a more accurate estimate of projected attendance would be only about one-eighth or about 12% of what a naïve estimate might suggest—the so-called “overstatement factor” or “coefficient of overstatement”. Integrated Insight did similar calculations comparing survey respondents’ stated attendance at other venues compared to their actual attendance, and again obtained an overstatement factor of about 12%. Integrated Insight used this overstatement factor in combination with other estimates (e.g., the number of potential venues at Merriweather Park at Symphony Woods, their respective capacities, and the likely number of events per year) to generate estimates on park attendance due to events. 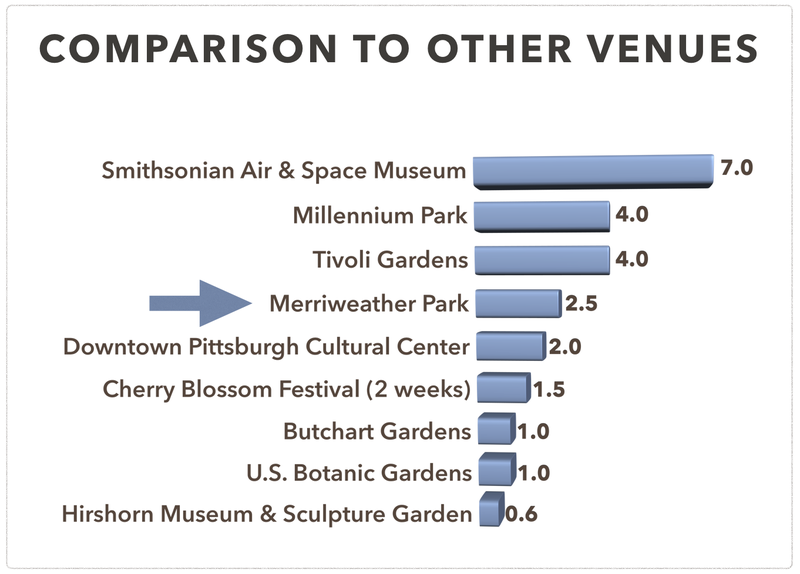 They also compared these estimates to actual attendance at comparable other venues (included those discussed above, like the Pittsburgh Cultural District) to see whether the estimates were reasonable. At the same time Integrated Insight generated similar estimates for people who might visit the park outside of special events, including those visiting for family or school outings. These were also adjusted using the same overstatement factor of 12% used in adjusting attendance estimates for events. The final estimate for attendance at a completed Merriweather Park at Symphony Woods was approximately 2.5 million visitors per year. This estimate includes attendees at Merriweather Post Pavilion and other performance venues, general park visitors (e.g., for walks and family outings), visitors for school graduations and other school-related visits, and people attending various special events (e.g., weddings or family reunions). This level of attendance would make Merriweather Park at Symphony Woods one of the more popular attractions in the Washington DC/Baltimore area—not nearly as popular as (for example) the National Air and Space Museum, but significantly more popular than Washington DC attractions like the U.S. Botanic Garden and the Hirshhorn Museum and Sculpture Garden. One problem presented by this level of attendance is how to accomodate visitors to Merriweather Park at Symphony Woods, especially during large events where a lot of visitors might want to leave all at once after the event is over. Integrated Insight assisted with this task as well, applying its experience in “industrial engineering” from the Disney parks and resorts to the proposed park pathway system. For example, in its endorsement of the design of Merriweather Park at Symphony Woods, the Howard County Design Advisory Panel also recommended that the Inner Arbor Trust review the width of planned pathways within the park (shown in the figure below). Integrated Insight provided estimates on how many people would be able to exit the park within a given time (in this case, 800 people per hour for each foot of pathway width). Based on these estimates the Trust revised its plans in order to widen certain pathway segments from 8 feet wide to 10 feet wide. The resulting pathway system, together with the entrance drive into the park off Little Patuxent Parkway, should be able to support the exit of more than 13,000 people going north within a 20-minute period. This will be more than sufficient for all but the very largest events, especially considering that traditionally most people have parked south of Merriweather Post Pavilion, not north, and that the 2,500-space parking garage planned to support the pavilion will also be to the south. Integrated Insight thus applied its expertise to multiple aspects of Merriweather Park at Symphony Woods, bringing deep experience in park marketing and management to the long-desired goal of developing Symphony Woods into an attractive and popular park. The next article in this series will focus on future features planned for Merriweather Park, features that will help round out the vision of the park that Integrated Insight’s survey respondents found so attractive. 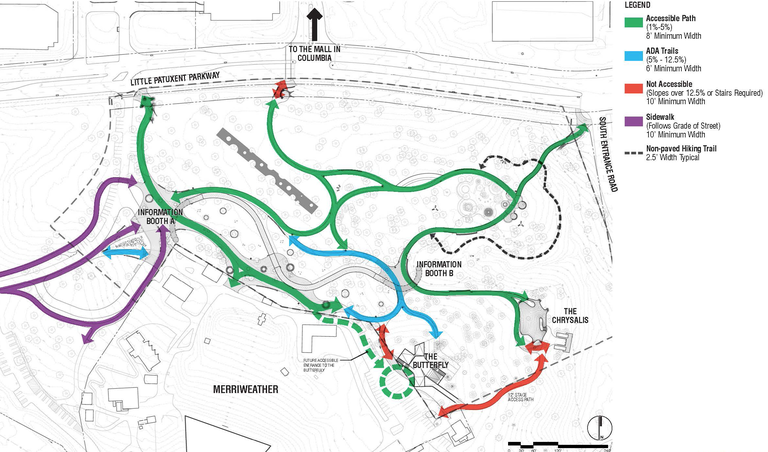 The proposed paths for Merriweather Park at Symphony Woods, classified according to size and accessibility. (Click for a higher-resolution version.) This diagram does not show the later increase in width from 8 feet to 10 feet on certain paths. It also does not show the addition of another accessible path running to the southern end of the Chrysalis. Image © 2014 Inner Arbor Trust; used with permission. Integrated Insight, Inc.: Management consulting [PDF], July 2014. A presentation of Integrated Insight’s executive team and their background, its areas of expertise, and representative projects. Merriweather Park at Symphony Woods: Market regions and comparative analysis [PDF], December 7, 2014. 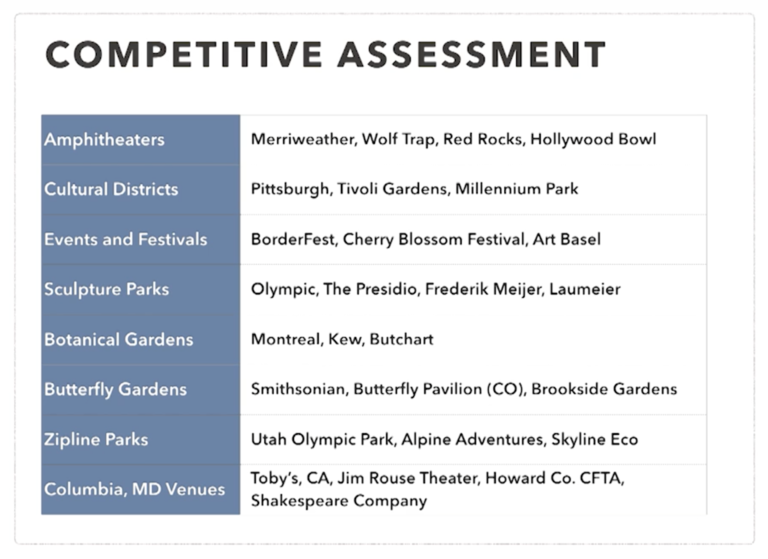 A presentation discussing the regions from which Merriweather Park would likely draw most of its visitors, and presenting information about other venues in the U.S. and elsewhere with comparable attractions and appeal. Merriweather Park at Symphony Woods: Product research and demand study (part 1, part 2, and part 3) [PDF], December 15, 2014. A presentation discussing the results of a public opinion survey concerning Merriweather Park and an analysis of potential annual attendance. “Math of Architecture, Architecture of Math” [67-minute video]. An event on November 3, 2015, sponsored by the Inner Arbor Trust to promote the Chrysalis project. Includes a presentation by Joni Newkirk starting at 10:40, discussing Integrated Insight and its research. Letter from Michael McCall to Randy Clay, March 14, 2014. A letter responding to the Howard County Design Advisory Panel’s request to the Inner Arbor Trust to review the widths of the planned pathways within Merriweather Park at Symphony Woods.